Betfair is one of the world’s largest sports betting platforms. Due to its reliability and safety, it is also one of the flag rooms in the network. Betfair is a part of the iPoker Network, meaning they can offer cash games at the highest stakes as well as a great tournaments schedule with huge guarantees. Playing on Betfair you can rest assured your money is safe and available for a fast withdraw whenever you’d like. And if you encounter any problems, their excellent customer service is always there to help. IPoker is the third largest poker network in the world and has been building its reputation as a secure and advantageous platform for many years now. In mid 2015 a merging of its players pool was announced, which previously consisted of 2 parts — IPoker1 and IPoker2. After that the traffic, massive as it was, increased at all the stakes. Deposit Bonus: Does not count towards the Rakeback Deal. Rakeback: Automatically starts at Gold Loyalty Tiers (maximum Vip level). 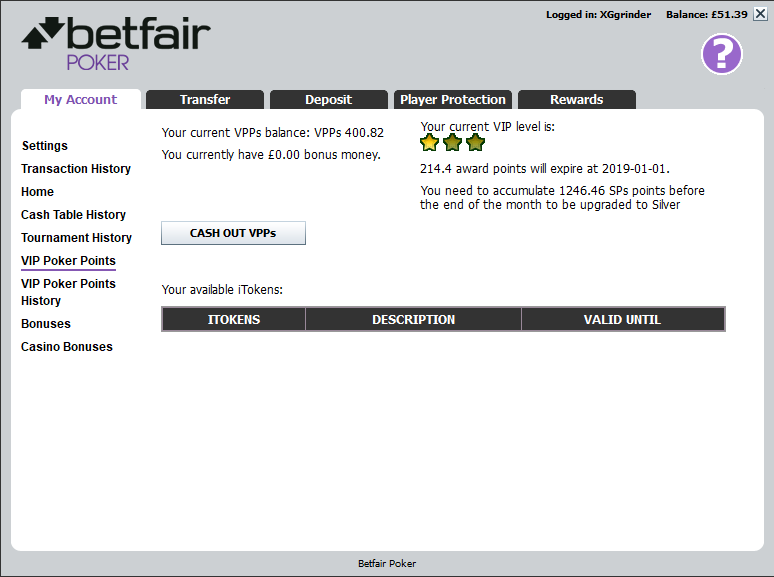 Betfair Poker is a part of one of the biggest international poker networks (iPoker). It, therefore, offers high and stable traffic at their cash game and SNG tables. Due to a large number of players tournament guarantees are also high. The traffic reaches its peak during the evening CET. You can select to keep your account in any of the available currencies, that are USD, EUR and GBP. After the pools of players have been merged, the traffic at the tables showed substantial growth. You can find dozens of NLHE tables at every stakes up to NL100. At this stakes, as well as NL200, the average number of tables played is 20+. The NL400–NL1K stakes offer about 10 tables each. The traffic in PLO is also excellent, it’s only 20–30% less than that of the similar NLHE stakes. Heads-up players will also enjoy a lot of action at HU tables all the way to the high stakes. Fast poker offers some action too, about 200 players at NL5–NL100 tables in sum. The SNG section is mostly represented by HU tournaments and games in a new format — “Twister” (the father of Spin&Go). This particular type of game is now preferred by the majority of SNG-lovers. The MTT section comes up with a variety of regular tournaments with guaranteed prizes and tournament series with excellent prize pools. All in all, IPoker is a “must-have” room for every MTT-pro. Since February 1st 2015, the rake calculation in iPoker is based on a system that uses the “Source Based Rake”. The distribution of rake in cash game and SNG has also been changed but the rake charging rules were not affected by these changes. The Betfair Poker Mobile app allows you to play your favorite poker games on all of your mobile devices. An Android and iOS version of the Betfair Poker Mobile app is available. You can, therefore, enjoy playing online poker on your iPhone, iPad and any Android mobile device. You can make deposits/withdrawals using the following: Bank Transfer, Cheque by Mail, Visa, Mastercard, Skrill, Neteller, PaysafeCard, ClickandBuy, Debit Card, Skrill Online Bank Transfer, Maestro, Paypal, Western Union. Cashouts are usually processed within 24 hours. Holdem Manager and Poker Tracker are allowed. A huge variety of Deposit/Cashout options are available to the players playing on Betfair Poker. Betfair Poker has a long history of fast and reliable cashouts. IPoker became the third largest network in the world due to many factors. The network’s pool of players consists to a significant extent of recreational players and random clients of a betting shop etc. IPoker offers the top-level software. Cashouts are processed immediately and you can quickly solve any arising issues with the help of online support chat. Betfair Poker is the image room of the network, being one of the best options for our professional players. Austria, Bulgaria, Canada, China, Cuba, DR Congo, Eitrea, France, Greece, Greenland, Honk Kong, India, Iran, Iraq, Israel, Ivory Cost, Japan, Kazakhstan, Macau, Lebanon, Libya, Portugal, N. Korea, Russia, S. Africa, Somalia, Sudan, Switzerland, Turkey, USA.